SIOUX FALLS, S.D. - A South Dakota billionaire known for making significant charitable contributions to health care, education and other causes is continuing to accrue wealth. 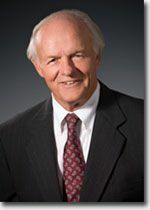 T. Denny Sanford's net worth jumped $400 million in a matter of months, according a Forbes ranking of billionaires. The Argus Leader reports the credit card magnate's net worth is listed at $2.6 billion, landing him at number 316 on the list. He is the only South Dakotan on the list. Sanford's lifetime giving total is $1.6 billion, which equals 38 percent of his net worth. Sanford owns First Premier Bank and First Premier Bankcard. His contributions to a Sioux Falls-based hospital system in 2007 prompted the system to change its name in his honor. Sanford Health has benefited from about $1 billion in donations from the philanthropist.